This weekend, I'm heading to NOLA to spend time with some pretty great friends of ours. Since we're going to be in the city that is famous for Mardi Gras, I figured my nail color should be just as bright and fun. 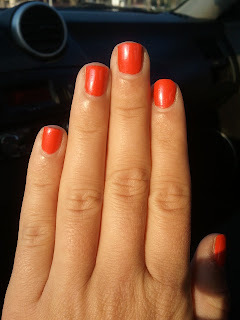 This weekend, I'll be flashin' Essie's Braziliant. I feel like they look much more like bright orange in the photo. Oh well, what's a girl to do? Love your color! :) Hmm, I need to paint my nails one of these days. Love the color! I have a boring old color on there right now since I had a job interview last week...going to need to change that this weekend :) Have fun in New Orleans! 1. I lived in NOLA until Katrina... I am so jealous that you get to go! If you get the opportunity, eat at this INCREDIBLE place called Jacques Imo's Cafe. You won't regret it. :) Also, the zoo there is my favorite one in the world. And I've been to a lot of zoos... just sayin. 2. I LOVE your nails! SO pretty! Your nails look great - such a pretty bright color. Have an awesome time in NOLA!!!! enjoy your weekend! your nails look fab!